I am lonely at The Mouse House. Very few people are coming to visit and shop. Maybe it's the 11% unemployment in South Carolina (8.7% locally and growing). Maybe it's because our real estate property assessments have increased over 20% in the last five years while average housing purchase values have decreased 15% in one year. Maybe people are just too scared to spend their money on artistic luxuries because they fear that they are the next ones to be laid off and will need their money for food. For whatever reason, we have noticed this trend, not just at the MH, but at charity fund raising auctions where donations are down, turn out is down, and purchases are down. One exception was the recent Light The Way charity art sale (Susan and the Mouse House were proud participants as were over 20 other artists) which netted over $4400 for the Midlands Housing Alliance homeless shelter during a three hour one day art sale. I am sure that other businesses have felt the same pinch as us, and I hope that in April and the comimg months things will improve. We'll see. During the month of April, we will be closed from April 13-20. We will be visiting Mathias in London and watching him dance at the London Coliseum. Grandma Linda (Susan's mom) wil also be travelling with us, and we will be staying at the plush London Marriott County Hall, courtesy of the 130,000 Marriott points that Linda cashed in for the trip. Thanks a bunch!! 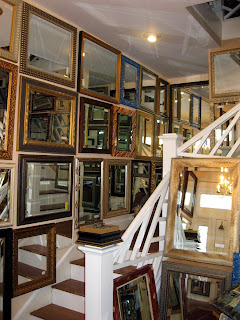 During this month, for anyone reading this blog and telling me so (an internet-only sale of sorts), I will pay the sales tax on your purchase of existing framed mirrors, framed artwork, and antiquarian prints. I hope to be inundated with sales from my loyal readers. Susan and I are approaching a very interesting anniversary in our lives. Way back on Good Friday, 1987, we were on our way from Columbia to Norfolk, VA to visit with my parents (both are now deceased). We had just recently moved from Ohio (January) where I had just graduated with my PhD from The Ohio State University, and I was just beginning my short-lived career as a Coastal Engineer. I think this trip was our first road trip from Columbia. We left Columbia after work Friday and drove up I95. It was late and we needed a room for the night but there were no vacancies anywhere. We decided to go off the main highway and look for anything, aka Janet Leigh in Psycho. 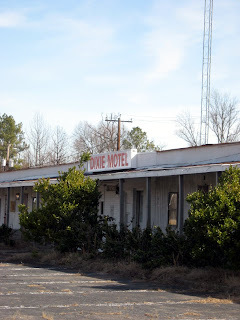 What we found was The Dixie Motel. It had vacancies and a diner/truck stop that was actually open and even served pretty edible food. 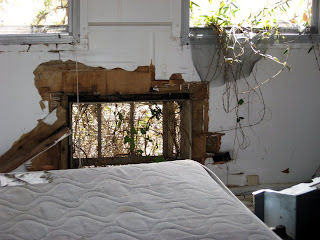 Our room had paneled walls, probably as thick as the paneling, a bed that bowed like a joggling board, and a bathroom so small that two people could not fit at one time. Numerous people before us had carved their names in the walls and left other graffiti that I wish I had photographed( no digital cameras for us then)! We could hear everything in rooms that were way far from us! 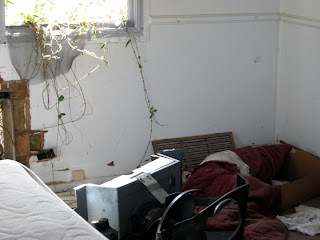 It was the most dirty, scary, and at the same time, charming place I've ever stayed in my life. We had always joked with our kids that we would all stay there one night during one or our many road trips from SC to Va to DC. In all the times over the last 22 years I've passed by this area, I never stopped. While Susan was in England I went up to DC (Feb 16) for my fix of good ballet - ABT at the Kennedy Center. This could have been Mathias' company if he had chosen this path (he was offered ABT Studio at age 16 and he has many old friends that dance in the company). On Friday I went to the National Art Gallery West Wing to see the Robert Frank photography show. Needless to say it was great and it probably inspired me to return to SC on Saturday via back roads. Specifically I traveled US 301 from Emporia to Rocky Mount, NC to see the national juried show at the Rocky Mount Arts Center that Susan is in. What a fabulous arts center! 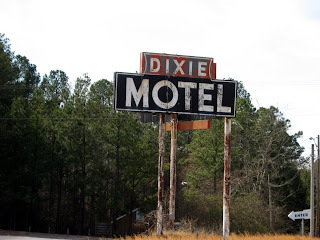 I finally stopped at The Dixie Motel and took these pictures. Who knows how long this motel has been closed and abandoned (probably years). The old diner was also closed and falling apart as was the motel. I could not remember what room we stayed at (we were to the right of the main office), but I'm sure they were all the same as the one I took pictures of. I even found a room key on the cement floor adjacent to Room 4; I don't know if it fit the door; I was a little paranoid of the no trespassing and hunting signs, the possibly of vagrants attacking me or the ghosts of patrons past. I am sure that if Susan was with me, we would have probably entered the room for better pictures. In any event, I had a blast. 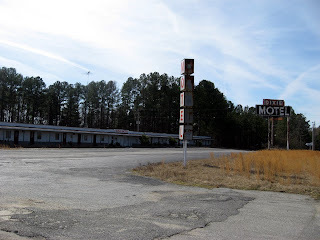 I drove the next 55 miles or so to Rocky Mount and lost count at the number of abandoned motels, businesses, and buildings I passed along US 301. They are, of course, the result of progress and Interstates. I wonder how much it would cost to purchase one of these bulidings and renovate it - probably too much - I guess that's why there are so many buildings standing as momuments to yesteryear. The front hallway in the Mouse House is finished and all mirrors have been hung. Here are some before and after pictures. The walls were in incredibly bad shape. This is not surprising since nothing had been done to the walls since we moved in in 1994. 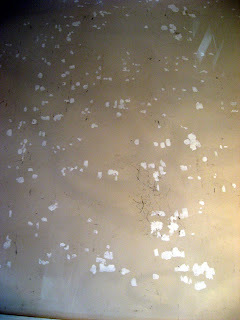 It took a full day to patch, sand, and also to Kilz the ugly upper wallpaper border. My next job will probably be Susan's sales room with the ugly grass-covered wallpaper walls. Good luck to me! 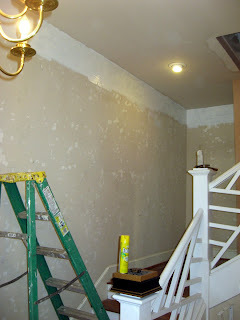 A photo of the front hall stairway before painting (click to enlarge). Note the wallpaper border near the ceiling. One wall with many of the nail holes plugged and sanded. 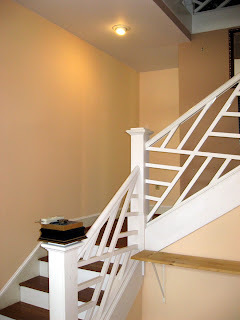 The other picture is a view of the stairway before painting. A view of the stairway area after painting. Such pristine walls! 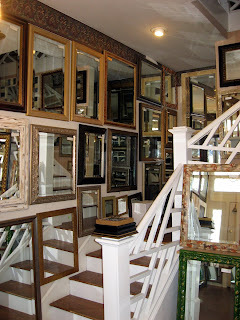 The freshly painted stairway with mirrors.